Toyo TC-600 Pistol Grip Supercutter with Tap Wheel Technology is engineered for cutting with minimum of hand fatigue. 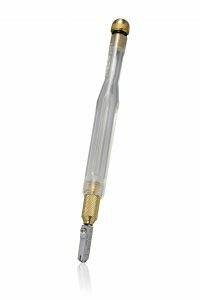 It has a lightweight, acrylic handle featuring a visible oil reservoir. The patented Tap Wheel has an axle bore with eight microscopic "cams" creating eight "taps" per wheel revolution. The result is longer wheel life and a cleaner, more consistent score. Colors vary. The Toyo Trac Wheel is a revolutionary new wheel featuring mirco-notches along the edge of the wheel. Trac Wheel notches provide traction for the wheel as it starts rolling on the glass, reducing chances of the wheel skipping especially at the start of a score. Manufacturing applications featuring this new wheel yield a significant increase in wheel life, clean scores and clean breakouts. The longer wheel life is attributed to reduced pressure being required to keep the wheel rolling on the glass. The notches which create traction for the wheel are measured in microns and not visible to the naked eye so there will be no effect on edge quality. 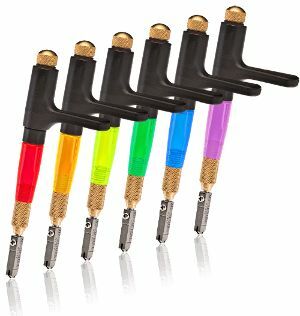 Comfort Grip acrylic offers a contoured handle that is shaped for lightweight comfort while still maintaining the high quality & performance. Available in 6 fluorescent colors. Wheel Hone Angle: 140 degrees. 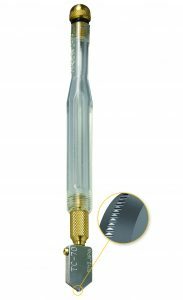 The Toyo glass cutter is the original, self-oiling glass cutter introduced back in 1976 and is still one of the most popular cutters available. Made with a heavy brass barrel makes this cutter a long-lasting workhorse in your studio. Equipped with carbide wheel for long life and clean cuts. Wheel Hone Angle: 140 degrees. The Toyo Custom Grip Supercutter features a customizable four-position handle to fit most any size hand and includes Toyo's patented TAP Wheel cutting head. The handle has an ergonomic saddle which comfortably rests in the palm of your hand allowing the strength of your arm to apply the necessary pressure for a clean score. TAP Wheel Technology ensures the deepest score possible with the least amount of effort and the pencil style barrel provides a versatile grip for both intricate pattern and straight line cutting. 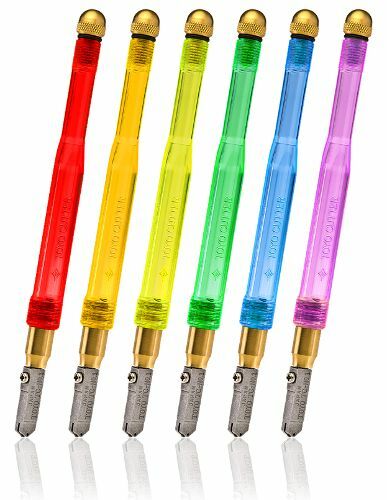 The Custom-grip Supercutter is available in six fluorescent colors. Wheel Hone Angle: 140 degrees. The Toyo Thomas Grip Supercutter is an automatic oil-feed cutter featuring a unique, ergonomically designed handle. The barrel is topped with a saddle that fits between the thumb and forefinger, creating a three-point grip that ensures precise control and reduces strain. Available in six fluorescent colors. Wheel Hone Angle: 140 degrees. The TC-6025 Supercutter features a rubber vacuum cup and scribed alignment demarcations for accurate tool placement. The thrust bearing unit is positioned on a pivoting radius bar which is ruled for precise adjustment. The blade rotates 360° to allow for positive tracking along the path of the circle at any radius. The cutting head has a replaceable wheel and axle as well as an automatic oil lubricated system activated when pressure is applied to the cutting handle. Cuts up to 25 inch (63 cm) circles. A synthetic lubricant specially formulated for Toyo Super Cutters. Water Soluble & Non-Corrosive. The squeeze bottle top conveniently fills your cutter straight from the bottle. 4 oz bottle.